An online petition to turn the Salesforce Tower into the Eye of Sauron on Halloween night is gaining momentum. In 15 hours since being published, the petition has received over 1,300 signatures from supporters of the idea. The top of Salesforce Tower has a screen made up of 11,000 LED lights, displaying videos and other art. Salesforce CEO Marc Benioff splashed cold water on the idea, saying that his company doesn’t actually control what goes on the tower’s display – and he wouldn’t be into it, anyway. 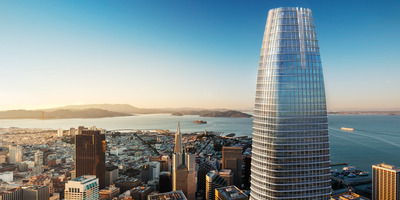 Some 1,300 people have signed a Change.org petition asking Salesforce CEO Marc Benioff to turn Salesforce Tower, the software company’s San Francisco skyscraper headquarters, into the Eye of Sauron on Halloween night. But Benioff has already splashed cold water on the idea. For non-Lord of the Rings buffs, Sauron is the main antagonist in J.R.R. Tolkien’s “The Lord of the Rings.” The Eye of Sauron appeared to instill fear and let it be known that Sauron was watching – something that would be appropriately spooky for the occassion. The petition’s description is simple: “San Francisco = Mordor. Salesforce Tower = Eye Of Sauron.” The petiton, created by one Red Rainey, seems to have resonated with people: It took only 15 hours to garner those 1,300-plus signatures, and it’s still rising. “Come on Mark [sic], have a sense of humour, this would be awesome!! !” one supporter wrote. Cushman & WakefieldSalesforce Tower, looking out over the San Francisco Bay. The recently opened, 61-story Salesforce Tower sports 11,000 LED lights atop its exterior, illuminating the top six floors with videos programmed by artist Jim Campbell and his team. At night, the light show can be seen from 20 miles away. The bad news: Benioff told Curbed SF that Boston Properties, not Salesforce, actually controls what goes on the tower. Boston Properties owns the tower, with Salesforce as the primary resident. And he says that if the tower’s display were going to commemorate Halloween at all, it would be with a “signal for Batkid” – a reference to Miles Scott, the young cancer survivor who “saved” San Francisco in a huge Make-A-Wish production in 2013. “I would prefer for it to become a signal for Batkid to return as our city needs a lot of love right now,” Benioff told Curbed SF. As for the likelihood that Boston Properties would give in and allow the Eye of Sauron to shine: In an interview with the San Francisco Chronicle before his installation went live in May, Campbell said his art would never contain advertisements or do holiday-themed display. He did not, it should be noted, explicitly say that the Eye of Sauron is off the table. Another thing to note: This would only be the latest connection between Sauron and the world of tech. Palantir, the secretive data-mining startup cofounded by Peter Thiel, got its name from a magical artifact used by Sauron to communicate with his evil forces and spy on their enemies. Palmer Luckey, the cofounder of Facebook’s Oculus VR unit, also appears to be a “Lord of the Rings” fan – his border security startup, Anduril, is named after hero Aragorn’s enchanted sword. Representatives for the Salesforce did not immediately return a request for comment.